a nationally televised Catholic network. 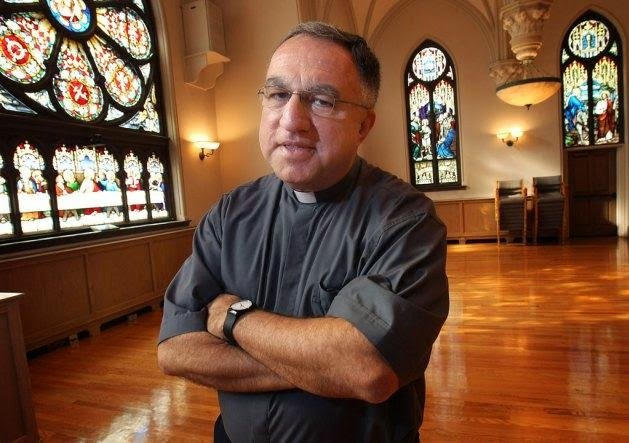 To sum up the absurdity, Rosica, who has long been known for speaking publicly in support of divorced and civilly remarried Catholics receiving Holy Communion (among other mistruths) recently re-tweeted African Archbishop Charles Palmer-Buckle's dissent of this Catholic dogma. This proved to be the last straw for both Domet and Rosica, for it was after David's blog denunciation of this social media signal of agreement, that Goliath, I mean Rosica, threatened legal action if Domet didn't apologize AND remove at least nine Vox Cantoris blog postings that also mentioned the suddenly-sensitive Vatican spokesman. For the record, I don't agree with everything Domet writes; I think David goes (way) too far when he states, "The Second Vatican Council and the Popes since have confused us in the message...[of] false ecumenism. They have allowed millions of souls to perish in Hell...[by having] prayed in a mosque or invited prayer with [Muslim] leaders." Certainly, false interpretations of Vatican II have led many a Catholic astray, but I believe that John Paul II's (make that SAINT John Paul the GREAT's) many missionary ventures brought millions to God rather than damned them. But, having had a hand in exposing dangerous and/or abusive priests myself, I fully support his exposure of Rosica's errors, and am happy to see Domet not buckling under the threat to remove the Palmer-Buckle post or any of the others involving the priest. If anything, the lawsuit shows Rosica's true character, for it is precisely the fact that this supposed lover of ecumenism doesn't dialogue with Domet about his dim view of Vatican II (similar to the views that have led others to leave the Church) but instead sues him for the very views that show he is still very loyal to Rome that makes the case against the doubtful Thomas. But back to Voris' analysis. As Michael accurately reminds us, "[If] White House Spokesman Josh Earnest said the US needs to attack the Middle East," he would be forced to resign by the next day for stating personal opinions contrary to the president; yet Rosica, who constantly expresses "opinions" contrary to papal teaching, is allowed to stay. Forget for a second the rather chilling conclusion that the pope's underling appears to be silencing only conservative rather than liberal bloggers, something that appears to be happening in both the United States and Domet's native Canada as well. The even scarier idea that Voris states is that by Rosica being allowed to continue as Vatican spokesman, it gives the impression that the pope "is either ignorant of his minions and their doings or he is supportive of their mouthings." Enter the elephant. While Voris is not about to examine the elephant in the room that Pope Francis is (secretly?) supportive of Rosica's liberal leanings, it does leave one to wonder. True, it is not as simple as, say the regrettable saga of the Reverend John Jenkins, president of Notre Dame, whose laughable defense of his defiance of both pope and bishops at Our Lady's University makes his apostasy a rather open and shut case. The Roman Catholic Church is a much bigger entity than the University of Notre Dame, and remember that even St. John Paul II did not discover the diabolical deeds of "friend" and Legion of Christ founder Marcial Maciel, and Paul VI did not detect "the smoke of Satan" in the works of friends such as Father Theodore Hesburgh or Archbishop Rembert Weakland until it was too late. As the story (or at least, this chapter of it) ends, we must remember to pray for all the cast members; that Domet stands firm and doesn't lose hope in the One, Holy, Catholic, and Apostolic Church, that Rosica resigns, or at least recants, and that Voris has both the cash and courage to continue his unique mission to both renew and strengthen the Bride of Christ. But mostly at this moment, we must remember to pray (and as Mary Bailey told her children in It's a Wonderful Life, "pray very hard!") for Pope Francis. In fact, it may be time to ask his and your guardian angels to pray real hard too.